An invoice is a financial document that records a sale against items or services. Customize your invoices to make them perfect. Create a template, upload your own logo in seconds, and even customize the column name that matches your business. If you frequently create invoices that have the same field or line item information, you can turn this into “Recurring Invoice”. And let your business paid automatic using “Recurring Billing“. Authorize.net – The payment gateway which allows you to accept credit card payments through online. PayPal – The payment gateway which allows you to accept payment through online. Our multi-currency feature allows you to interact with businesses in other regions by switching certain apps to use their currency. You have the ability to allow your customer to owe in the currency of their choice within certain apps. Invoices App doesn’t just support your business with invoices; it comes with many other apps to run your business. All apps are deeply integrated which communicate with one another. Any project task or opportunity or estimate can be recorded and invoiced to a customer. Bill your customer on a schedule. Create invoice in a single click for more than one timesheets or work orders. 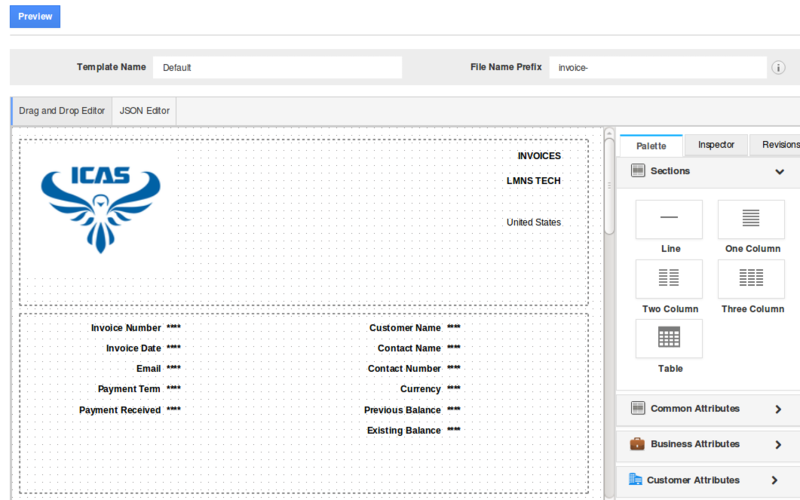 Ability to select different layouts for your invoice. Invoice numbering based on your preference. Export to PDF and Email PDF to client. Multiple invoice types – Creating invoice from different objects such as orders, work orders, projects, timesheets, estimates, opportunities etc. Ability to view overpayment and invoice summary(Previous balance, payment received) of a customer. Include sales rep commission over items. Turn your invoice as paid by recording customer payments. The invoice dashboard helps to answer the question “What information does my CRM Invoices App feed for my business?”, the page displays the invoice-specific data that’s associated with your business. It also allows you to see the updates at a glance. These updates can be customized according to your requirements. Invoices news feed displays all the product-specific activities. For the convenience you can filter the people’s activity by choosing the name. At the top of the Newsfeed the field called filter feed by which filters the activity according to the selected name. Choose the employee name by clicking the dropdown People, search the people using the search option in the drop down or else select the employee name you would like to view the activities. Click Apply to perform this action. You can type your own comments in what are you working on? Editor folio and post them. You can seek the Newsfeed by search Newsfeed above the post folio. The dashboards are more efficient and ease to find all the feature. You can find three gear icons namely home, notifications and settings. This header part is the master one which follows to every page so that you can easily direct to the page you would like to view for. It redirects to the homepage of the Invoice. You can quickly view the recently created invoices. It is used to offer a Newsfeed related to the Invoices App. It also provides the link to the individual along with the integrated apps. This is due in part to the communal nature focusing all the integrated apps, as well as the ease of creation. The invoice app is powered by the global notification system in all Apptivo Apps. This system allows you to receive updates to your news feed , as well as email updates for many different events that can occur within the app. Each employee can configure their own invoice notification set up. A invoice configuration enables to frame the invoice with a perspective you need to record as per your requirement. An Apptivo invoices have covered with settings which attain such qualities. Simple search allows you to search using a single search field located in the header bar. It takes one search string as input and displays the results. If you are unable to get the desired result from the simple search, you can use an advanced search. With advanced search you’re able to find very specific groups of invoices with the help of multiple search fields. Apptivo provides an extraordinary section of recent invoices which displays all the invoices created and modified recently, it displays them with status, invoice # and invoice created date. The Invoice record is used to store all the invoice information and to display the payment information regarding the invoice. Invoice information includes an invoice number, customer, services provided, items/products, credits, tax applied, payment term, invoice date. Invoices App can be modified as per your requirements. One important tool for adjusting the invoice is the possibility to add the custom fields. The invoice attributes describes each and every field of the invoices. These attributes are involved in the invoice creation. *Customer Type in the customer name, the field will be auto populated or can create the new customer. Contact The contacts associated to the customer will be pre-populated. Sales rep Employee assigned to that particular customer will be pre-populated. *Invoice date The invoice created date for the customer. Discount The discount allowed to the customer, can mention manually in percentage or at a fixed rate. *Payment term This term defines the payment period. PO/WO number It is a reference number of the purchase order for the future reference. Template This is the default format for invoice with more styling options including logo, sections, business attributes, customer attributes etc. *Currency Multi currency capabilities allow to develop and maintain productive relationships with international customers and vendors while handling a number of transactions in any number of currencies. Notes to customer The description about the created invoice is given as a note to the customer. Services provided Create the invoice for any services by filling the actual values. Task name The name of the task can be defined as the services. Hours The duration of the tasks is mentioned here. Rate The unit price for the tasks. Tax code You can choose what tax type to be applied. Amount The total amount accumulated for the hours and rate for per hour along with tax is calculated as an amount. Actions Notes and delete icons are the preferred icons. You can add more description either for services and/or items. It allows to enter the fields such as item name, quantity, Rate, Tax code and Amount. Subtotal The subtotal is the gross amount which includes the amount. Discount Discount field will be accumulated from sub total and the value given in percentage or fixed amount. Tax The tax is applied to the items and/or services. Shipping and handling are the cost spent for products/items and/or services including money, time and for labour. The promo code is a code that is used to identify the person or company. It’s used to give you a discount due to some sort of special. Total Total amount that this invoice holds including tax, discounts etc. Credits Credits are followed from the credit notes. This is the sort of customer over payment. Amount due is the subtraction of total amount and credit amount. These are nothing but having the options such as add tasks, add items, preview, save for later and email invoice. This navigation part is landed in a port section of the Invoices home page. It is the most important section because all the invoice is displayed under the following lists. The invoice navigation which describes the specific actions related to the invoices. These features are confessed on the configuration, they can be configured with your requirement. You have the ability to create a new invoice, from another invoice, from the project, from the timesheet, from a work order and from an order. It is directed to the home page of the invoice, to know the specific history about the employee activities. The invoices created can be separated based on their status. You have the ability to print PDF, send invoices to the customers, record payment, make as an archive, void the invoice and export them into IIF beta. The payment that has not been made as of its due date. An invoice which is past due will be collected under past due. The invoices which are not paid yet will be found under this tab. The invoices with recurring payments, generally the recurring payment periodis monthly, bi-monthly or weekly happens on the same date each period until the invoice is paid. It has the ability to queue the approved work orders and timesheets for the easy view and generating the invoices. If the same customer has more than one approved work orders or timesheets they also included in the same invoice. This is maintained for the reminders of past due invoices, you can set the automatic reminders, these are managed in Settings where you can create one or more to apply to your invoices. These can be removed, disabled or edited at any time, for instance if your payment terms change. Export the invoices in quick books IIF beta. This may include the period for viewing the invoice summary. Generate reports are very useful to extract a set of records easily. In invoices the reports are customized according to their timesheet the reports are customized according to their month, according to the employee name and general reports are also extracted easily. So it makes easy to export into MS-Excel. In your CRM, Invoices app allows you to create an invoice from various ways. Create Invoices from Orders allows to see the Sales Orders pending to be invoiced and automatically generates the corresponding item lines based on orders. If there are several Goods Shipment that take place in orders – several item lines are generated in Sales Invoices are generated for each items with its description. Create invoices for the hours logged in a project, based on the project billing method the invoice amount will be accumulated. Create invoice for customer approved timesheets, once the timesheets gets approved from customer, you can instantly view the generate option in timesheet view page. You can also create invoice for more than one timesheets for the same customer. Create invoice for work orders, if your employee completed the service requested by customer on his location. The invoice can be created followed by another invoice, the base information of the invoice will be carried through to the new invoice creation page. It can be modified and send to customer. The invoice can be created from estimates or quotation approved by customer, once the estimate gets approved from customer, it can be converted into invoice. Note: The estimate cannot be converted to invoice multiple times. Invoices can be created from opportunities, the deal which are closed won against the customer can be converted into invoice directly. The customer who pays the same amount for every month – just create or set-up recurring invoices with how often that invoice recurs and send invoices regularly to your customer. You can specify a schedule for a recurring invoice and automatically generates invoices based on this schedule. When you create an invoice, you can enable automated payments if you are using Authorize.net as a payment option. When your customer pays for the first time, Invoices app will create a payment profile with this gateway and your customer will be automatically billed periodically. You will see a section called “Recurring payments” on the Create Invoice Screen. Create invoice for the customer’s overpaid amount, if your customer has overpaid to your business, you can apply this amount while creating invoice. Before creating invoice, you need to configure invoice numbering and invoice lines through settings. You can also customize PDF templates of an invoice that how it looks for a customer. The CRM supports you to have a quick view of approved work orders and recurring invoices that to be mailed in the notion of invoice queue. So it makes you easy to create an invoice directly. It collects all approved timesheets to generate an invoice. If the same customer has more than one approved timesheets then invoice can be proceeded for all the timesheets approved for the customer. The work orders collect all the approved work orders to generate an invoice. If the same customer has more than one approved work orders then invoice can be created for all the work orders approved by the customer. For instance: The Employee (Katie Dustin) has submitted the Work orders to his Employee manager. If the manager approved that work order, it will be collected under the invoice queue. It collects all cases which are billable to generate an invoice. You can generate an invoice from the Cases app or from the Invoices App. Invoices App allows generating an invoice for the billable cases using invoice queue option which was located on the left navigation panel. For instance: The Employee (Katie Dustin) has created the cases. Make sure to know that the created case is whether billable or not. If those cases have been billable, it will be collected under the invoice queue. All the recurring invoices which are about to send to the customer(“To be Emailed”) are queued. From here you can edit or delete, print them to PDF format, export to IIF beta, resend the invoices to the customer, can also archive them. You can even choose multiple recurring invoices to perform the mentioned actions. For instance: The Employee (Katie Dustin) has created the recurring invoices which are queued up to approve and send out to customers will be collected under invoice queue as a recurring invoice. The paid invoices without late fee can be viewed in “paid” option under “By status” drop down from left navigation panel. The invoices which are paid can have penalty amount or late fee that is the amount calculated for delayed days are viewed in “delayed invoices” under “Invoice Queue” where it allows to create new invoice for that penalty amount. The unpaid invoices without late fee can be viewed in “Unpaid” option under “By status” drop down from left navigation panel. The unpaid invoices with penalty amount that is the amount for delayed days which are collected to “outstanding invoices” under “Invoice Queue” where it allows to create new invoice for that penalty amount. Invoices App Collects all retainer contracts which was approved by the manager. Retainer contracts have able to generating an invoice either by cases app or by invoices app. In Invoices App invoice queue helps to generate a retainer contract. For instance: The Employee (Katie Dustin) has been sent the contract to his manager for approved it. If the manager approves the contract, then it will be able to generate the invoice. Now the employee generating it from contract app or from invoice app using invoice queue. Recurring invoice is flexible, letting you decide whether invoices are emailed out automatically. Send an invoice to your customers on a regular interval for the same amount of product/services provided. Enable the recurring invoices to generate new recurring invoice for the customer. All the currently active recurring invoices are found under this tab. There are action buttons to pause/resume the recurring invoice and/or to ‘stop’ the recurring invoice. All the expired/stopped/completed recurring invoices can be found under this tab. If you’ve a customer who pays the same amount for every month – just create or set-up recurring invoice with how often that invoice recurs and send invoices regularly to your customer. Note: If you create recurring invoicing for your customer, then you can record the payment for each and every child invoices but not for parent invoice. Schedule makes invoicing easy by viewing everything you need in one sheet, so you can send an unlimited number of customized invoices and track them all. An invoice schedule consists of the invoice months, amounts that are used for the creation of invoices and total amount of invoices. The invoice status of an invoice schedule can have four different schedule type: Planned, Invoices, Collected, Overdue. You can stop recurring invoices and also recurring billing, this will permanently stop notifying the customer. (Note: you cannot withdraw or undo the invoice once stopped). Every business needs are different, so the CRM gives each business the opportunity to customize their invoice to exactly what they need. There are many different settings that can be tweaked and changed for your business. Businesses have the option of turning on or off auto-generating invoice numbers. Some may prefer to type in their own number on each invoice. You can also include a prefix along with the number if you need. Use accounting rules to determine revenue recognition schedules for your invoice lines. You can create a accounting rule to each invoice line. It is similar to workflow feature but there is the slight differences where you create a standard template for the memo that should be posted on to each journal entry. Using settings, you can easily customize the payment methods.There are various types of payment methods available for you – Authorize.net, PayPal, Zipmark, cash, check, credit note and wire transfer. These are all enabled by default but if one is not needed by your business, it’s easy to disable. Of course tax is unique to each city, county, and country, so it’s important to customize taxes. Apptivo supports both single rate and multi rate tax codes. Users can also select if they want to tax at the line item or header level. Customize the invoice by adding or removing fields that are specific to your business only. Re-arrange fields to your liking. The PDF template builder is easy to use, you simply custom pdf template by just dragging and drop fields into place. Setup friendly reminders to send to your customers when their payments are a few days overdue. You can customize reminder in invoice by setting the number of days from overdue and we’ll automate the sending of the reminder.